If heaven must recompense our pains. The last quote is from the last verse of a hymn by Charles Wesley, Jr. entitled "The Morning Flowers Display Their Sweets." It references Isaiah 40:6-8 in the Bible. 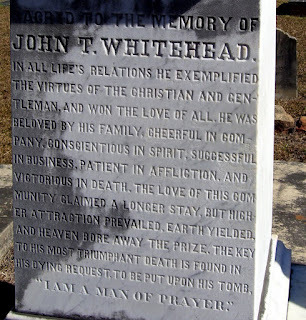 At the top of Mr. Whitehead's tombstone is an urn. This form of funerary art has been written about before on this blog, and you may read about it here. 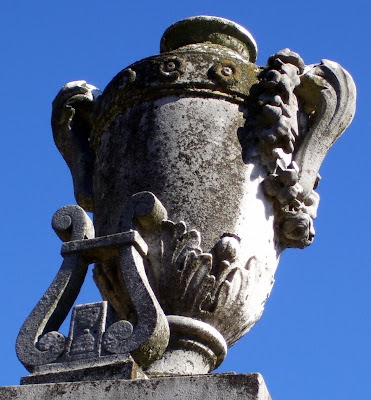 Placed near the bottom of the urn is an hourglass that looks to me to be within a lyre without the strings. 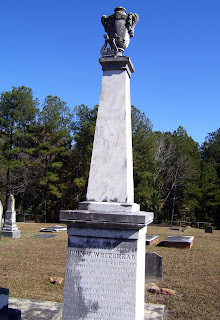 The hourglass symbolizes the passing of time. The lyre, kin to the harp, may represent heavenly desires.